If you want to know what mind-numbed zombies look like, you don’t have to watch AMC Network’s hit series, The Walking Dead. That’s because billionaire Facebook founder Mark Zuckerberg just gave us a look. As you can see from the above image, which was taken at Samsung’s Mobile World Congress, which he proudly posted on his own personal Facebook page (where else?). “I just joined Samsung to launch their new Galaxy smartphones and talk about the future of virtual reality,” he wrote from Barcelona, Spain, where the conference was being held on February, 21. An important part of the Oculus experience is 360 videos, where you can look around and feel like you’re actually in the video — whether that means surfing in Tahiti, flying with the Blue Angels, or exploring the surface of Mars. Here’s a new stat: people have already watched more than 1 million hours of 360 videos in Gear VR. I’m looking forward to seeing even more great content as VR continues to grow! 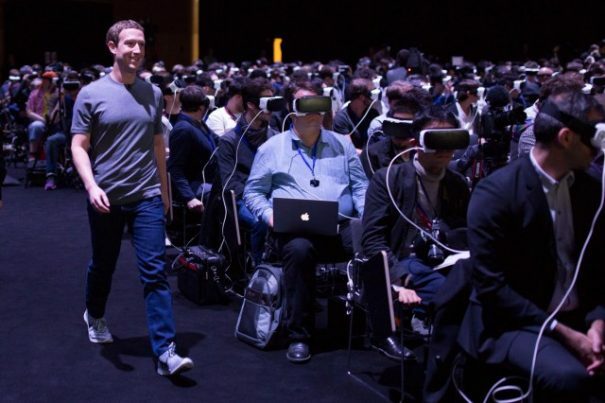 A billionaire superman with a rictus grin, striding straight past human drones, tethered to machines and blinded to reality by blinking plastic masks. Golden light shines down on the man as he strides past his subjects, cast in gloom, toward a stage where he will accept their adulation. Later that night, he will pore across his vast network and read their praise, heaped upon him in superlatives, as he drives what remains of humanity forward to his singular vision. Oh, but it’s just a harmless piece of technology – right? Nothing to see here, nothing to fear. Except everything. Think of what all of our electronic personal devices already do to our attention span, our psyche, our mental state. Imagine now, if you can, a device that actually implants thoughts and intentions directly into our minds, through a reality which we can’t tell is real or imagined. Think about the current presidential contest and the political state of the country. What would a political party do to get its hands on technology that could “sway” voters to side with it over the opposition party? What would that technology be worth? That Zuckerberg chose to voluntarily share the image can mean only two things – that he’s so arrogant as to believe no one notices the evil connotations, or that he is so self-deluded he believes there is seriously nothing wrong with what he’s helping to create. There may be some good uses for virtual reality headsets – heck, even some NFL teams are using them – but the underlying fear that such devices could ultimately be hijacked and used for ill-intent is real, and it’s terrifying, for the public would be oblivious to the changes.